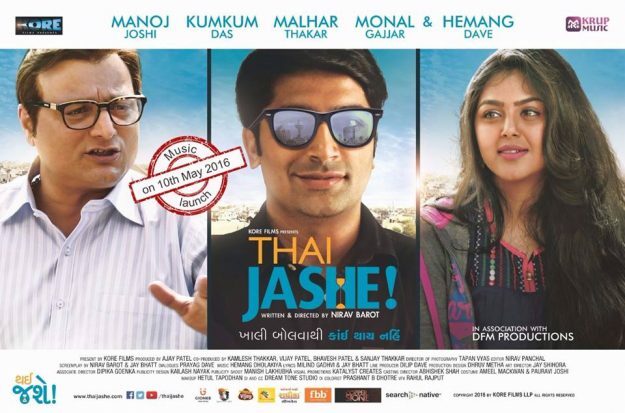 Gujarati Cinema is going through a positive change. In recent years many hit movies gave much needed breath to the industry. To join the list of these movies, very promising movie ‘Thai Jashe” is coming up. We at Krup Music are extremely happy to be associated with this film for music distribution. The music of the film will be released worldwide via physical CD & online distribution through Krup Music Record Label. The release date is set on 10th May 2016. The songs of the movie are penned by Milind Gadhvi & Jay Bhatt, while the music is given by Hemang Dholakia. The Music will be available on all leading online platforms including iTunes, Hungama, Saavn, YouTube, Amazon MP3 as well as the leading Music Stores like Crossword etc. So get ready for the music release. To get notified about the YouTube release of the songs, subscribe to our official channel. Great . congratulations . Go ahead.